I've recently been sporting a bright Pink lipstick, which nowadays, I must admit is slightly out of character for me. Whilst it hasn't been my go-to shade since well, becoming a mum when I decided that lighter shades are much easier to upkeep throughout the day, Bobbi Browns Malibu Nudes collection wowed me and this duo of products have been reached for very frequently and have received a fair few compliments. 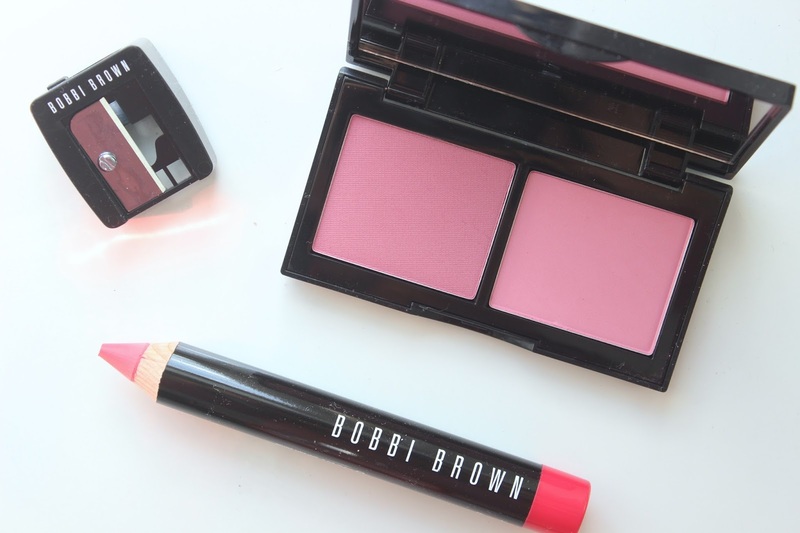 Bobbi Brown Art Sticks (£20.00) are chunky pencils, that can be used as both a liner and a lipstick alike. With what I would describe as a semi matte finish, they're comfortable on the lips and now come in a delightful range of eight bold shades thank you to the Malibu Nudes collection. Punch is a bright Orange Pink, perfect for warmer days and as stand out shade, I've recently loved wearing it as a focus point in my make up. Malibu Nudes also saw the creation of four blush duos (£29.50) which include Pastel Pink, Tawny, Sand Pink and Plum/French Pink which is swatched above. Inspired by flushed cheeks after a day in the sun, the duo has been created to use both shades together, the darker shade on the apples of your cheeks and the lighter up your cheeks, for a subtle flush of colour. I normally wouldn't wear Pink cheeks with a Pink lip, but in this case I really like the combination of both of these products. This collection has been out a little while, but is still available to buy online and at counters in stores such as Selfridges and the like. Love that shade! I like the idea of a semi-matte lip product because matte lipsticks dry my lips out sooo badly, definitely have to give this a try!